So finally sliced up my class experiments from the weekend. 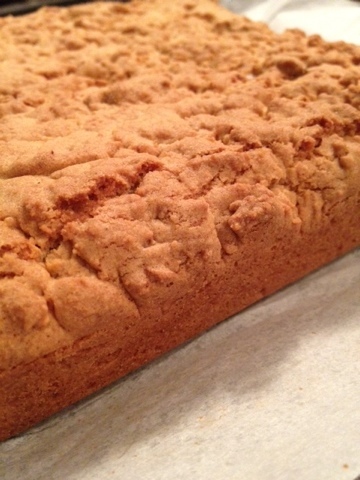 Very crumbly and super sweet. Would taste great warm and with a nice scoop of vanilla ice cream or creme anglaise. 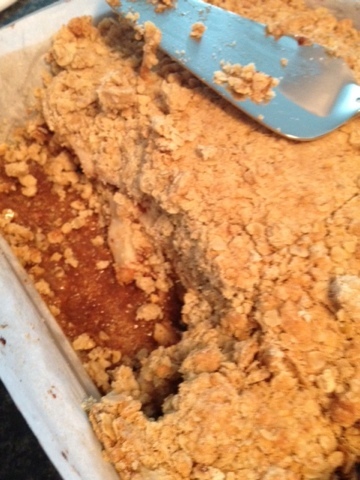 Apples were still crisp and a bit tart which was welcome against the super sweet graham crust. I think next time I’ll cut down on the sugar content. 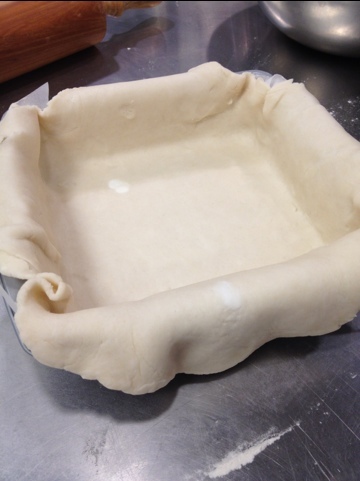 I liked the pastry dough crust. It gave the creation some structure. The blueberries could have been a bit sweeter. Fresh berries would work well in future. 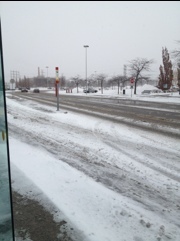 It is snowing in Toronto. After a few weeks of mild winter weather, old man winter is here to visit and he has brought with him snow and a -23 windchill. Boy was I glad to be inside staying nice and toasty beside some industrial gas ovens. 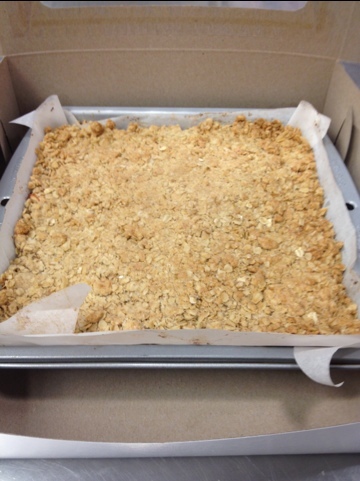 Today we made blueberry streusel and apple brown betty. 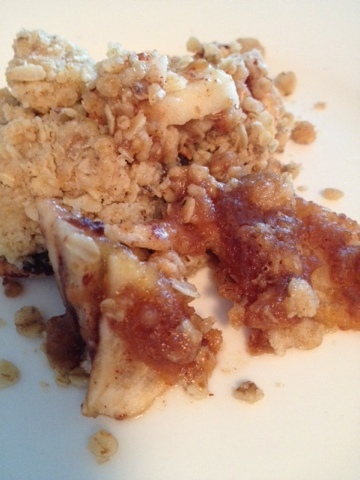 Both involved an oat, sugar and butter topping. 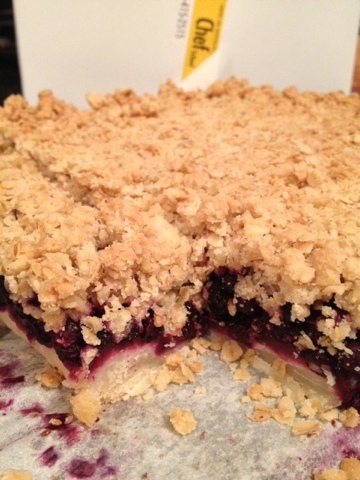 For the blueberry streusel we made a pastry dough base. 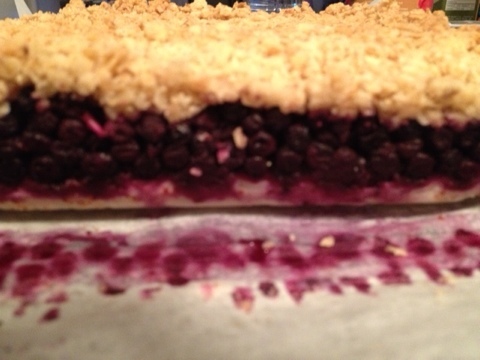 Then layered on frozen blueberries that had been mixed with sugar, cinnamon and lemon zest. 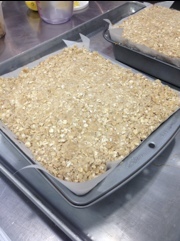 Again topped with the oat topping and baked for about 40 minutes. I cannot get over how much fun I am having in my bars & squares classes. Each class I laugh and it doesn’t feel like work. 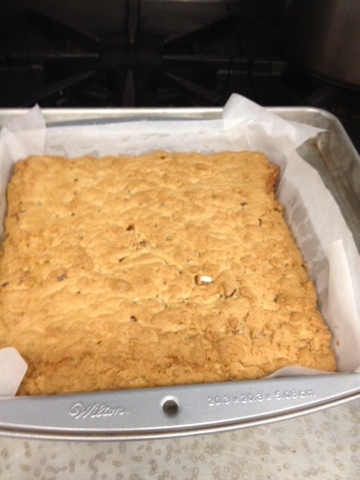 On top of that, the recipes turn out well, we get out fairly early and sometimes even come home with spare ingredients, enough to make another batch of bars. It’s great! 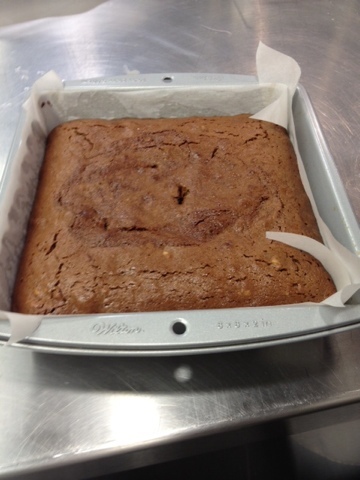 In this class we made pecan blondies and fudgey walnut brownies. 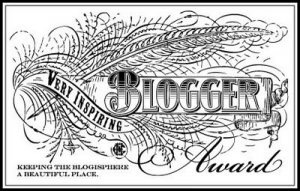 Standard fare in the bars & squares world I’d say. And very easy to make. I’m all about simplicity. Scaled out. 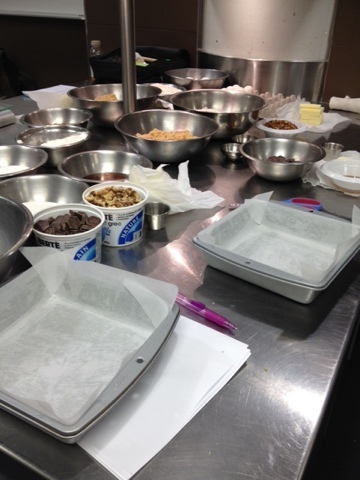 A counter top full of ingredients. We begin the blondies by creaming butter and sugar together and then adding eggs, vanilla, flour, baking powder, nutmeg and salt. 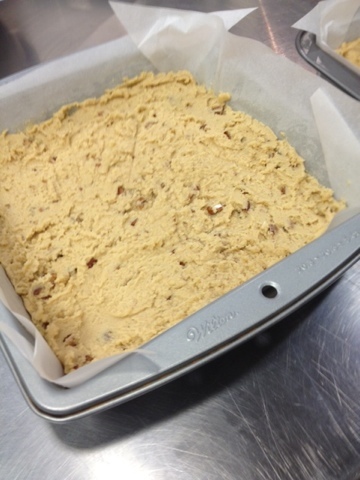 We throw in some pecans at last. 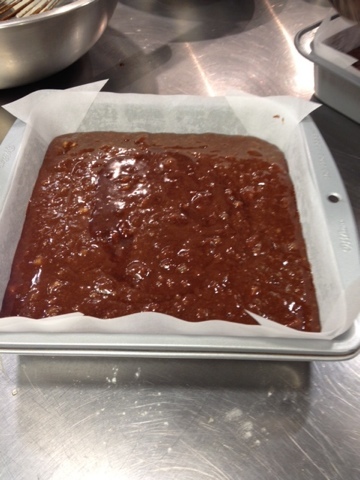 Then we spread the mixture into our cake pans and into the oven they go to bake for 30 minutes. The brownies are mixed completely in a saucepan. 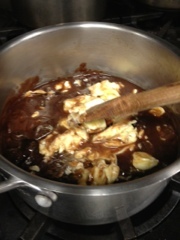 We melt butter, chocolate and corn syrup on the stove. 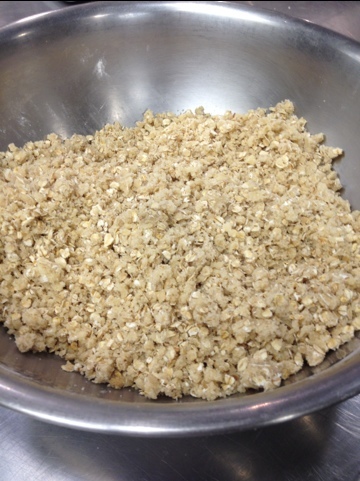 Once all is melted, we take it off the heat and stir in sugar. 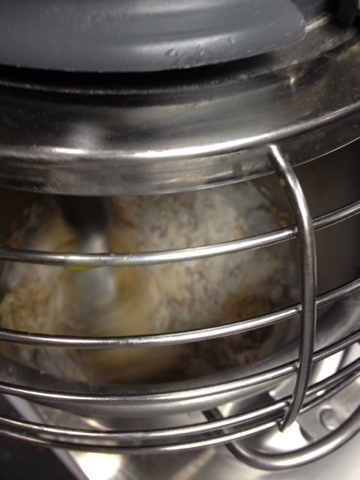 Once the sugar is incorporated we add eggs and vanilla in a steady stream making sure to keep whisking. 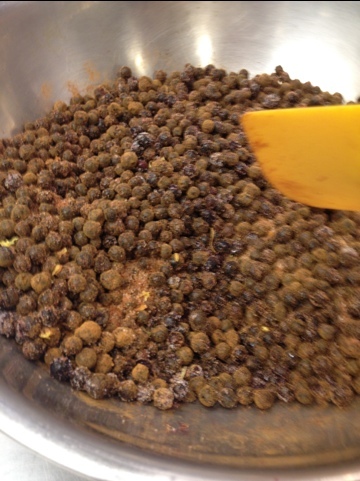 At last the flour and walnuts are added and everything is stirred until well mixed. 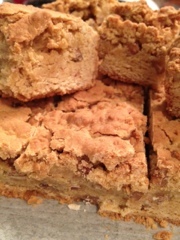 The blondies had a nice crispy top crust. It was sweet and nutty and the nutmeg flavour really stands out. 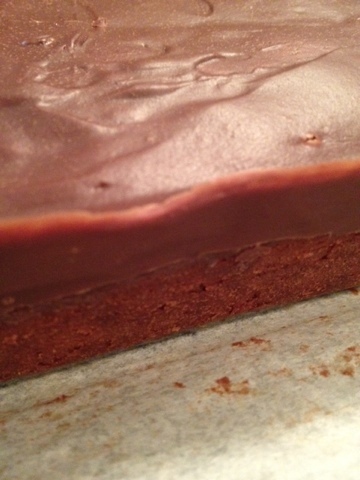 We made a glaze for the brownies and slathered it all over the top. 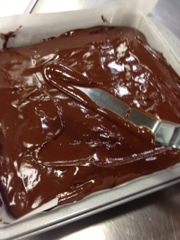 Once cooled and cut it was ready to be eaten. 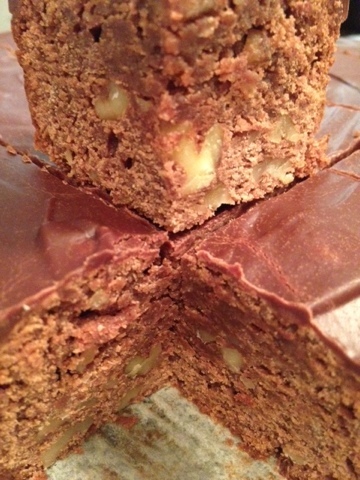 The brownies were decadent and the walnuts gave it a nice crunch. A great way to satisfy my brownie craving.